Mets rise to first in the NL East: can we really stop the season now? So, all I had to do was ignore them for a while, and they rocket from the cellar of the NL East to first place, sweeping successive series from the Braves and Dodgers. I was sure their tenuous grip on the top rung would slip tonight, as they faced the defending National League champion Phillies in Philly. Not so. Just as an amusing game, let's imagine what would happen if the regular season were over now. In the National League, the Cards, winning the Central and having the best record in the League, would open with home field advantage against the Giants, assuming they win tonight; they lead the Rockies 5-2 in the bottom of the sixth. (Should Colorado rally to win, the NL wild card would go to the--believe it or not--Nationals.) The East champion Mets would have home field advantage facing the West winners, the Padres. In the Phony Baseball League, the best record would belong to the East winning Rays, who would face the West winners. That could be the Mariners, should they win a game with the Rangers that's now tied at zero in the bottom of the tenth; if Seattle loses, it would be the winner of a one-game playoff between the Angels and Athletics. Meanwhile, the Central champ Twins would face the wild card Yanks. 5/1 update: of course, all I had to do was start watching them, and they imploded. The "of course" may seem gratuitous, but I'm enough of a narcissist (or is it solipsist?) to wonder if my act of observing them alters the facts on the ground. Are the Mets like Schroedinger's cat? 5/2 update: so much for brief dreams of glory. If Santana can give up ten runs, I'm back to ignoring baseball. Harvard Law Dean Martha Minow on the Stevens succession and other things. Martha Minow is the twelfth Dean of Harvard Law School (not counting those who have served in an acting capacity) since the deanship was established in 1870 (the Law School itself was established in 1817), and the second woman--the first of whom was her immediate predecessor, Elena Kagan--to hold that office. She and Kagan, who left Harvard to serve as Solicitor General, are now both under consideration as the successor to retiring Supreme Court Justice John Paul Stevens. 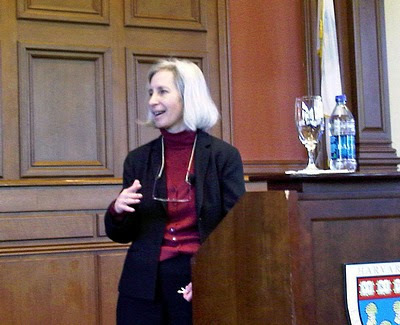 Last weekend, I attended a class reunion in Cambridge, and Dean Minow spoke to the returning alumni. As expected, she concentrated on what was happening at the Law School, prominent among which was the curriculum revision, the first of any real substance since the Law School's first Dean, Christopher Columbus Langdell, introduced the case method. Minow had been appointed by Kagan, while she was still Dean, to take on curriculum reform, and so was instrumental in adding to the first year curriculum (by reducing the traditional courses such as contracts to four hours from five) courses on legislation and regulation, as well as a January inter-term devoted to problem solving. When she invited questions, Dean Minow got many about Law School issues, but some on national ones as well. One alum asked how she felt about a former student of hers, Barack Obama, becoming President. A Yale Law alumna, she responded with a paraphrase of the final words of another famous Yalie, Nathan Hale: "I only regret that I have but one faculty to give to my country." She explained that, since President Obama's inauguration, Harvard Law had lost seven faculty members (Kagan presumably included) to Washington. Inevitably, she was asked her thoughts on replacing Stevens. She said that his were "very big shoes to fill." She recalled being called into his chambers, during her time as a clerk to Justice Thurgood Marshall, and told by Stevens that her memorandum had caused him to reconsider his position on a case. In any event, she said, she hopes his successor equals his qualities of character, independence, and conscience.